In September 2015 Mix96 announced live on air that Stocklake Park School (including Harding House) and the school charity MASKS, were the deserved winners for the 2016 Mix96 Community Challenge. The transformation has been completed, so take a look at the photographs on the Mix96 website. Once the winners had been announced, Andrew along with members of his team met with Gill Mullis, Head of School, to go through the schools wish list. 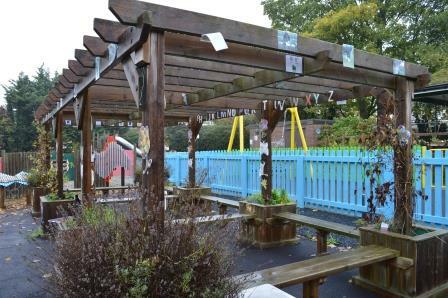 Gill said: ‘We’d like to add a lick of paint to our wooden playground equipment as well as create lots of outside distinct learning areas that all students, irrespective of their learning difficulties, can participate in. We also have an indoor sensory room, which really needs a facelift. ‘The transformation will make a huge difference to all our students as it will give them access to wide-ranging activities throughout the year. The Trust will work alongside local partners including Travis Perkins to carry out the transformation. Andrew said: ‘We work with a range of contractors so we have extensive skill sets and materials available to us. It is an excellent opportunity for our employees to get involved so they too can make a real positive impact to the project. ‘We can certainly carry out the majority of tasks the school would like. My team and I now need to liaise with our colleagues and contractors to ascertain what we are able to do within the given budget.